The veg patch is now fully functional with plants and everything. We even have a greenhouse for some of the more tender plants for whom a slight frost would spell certain doom. So – this is what we’ve planted. Bed 1 – herbs (and later in the month, salad leaves) – for now we have rosemary, thyme, oregano, fennel and parsley (both flat leaf and curly leaf varieties). 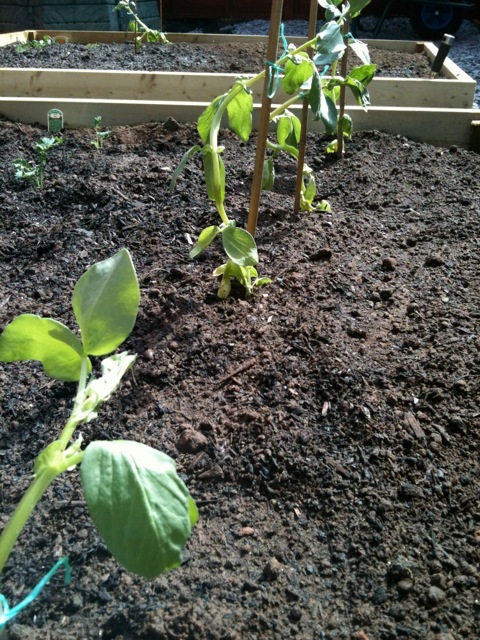 Bed 2 – broad beans, kale (again, two varieties) with leeks and courgettes joining them shortly. Bed 3 – this has garden peas and more broad beans and this bed will be added to as the weather warms up a bit. Elsewhere we have potatoes on the go and rhubarb. Does anyone have any suggestions or thoughts about their veg patch they’d like to share? All tips are gratefully received! After lots of research, we opted for tannelised decking joists for the the raised beds. We looked at sleepers (too toxic, apparently), scaffolding planks (too grotty). I constructed three beds – 2.4m x 1.8m, fact fans – and placed them in situ and used wood fencing spikes to secure them. 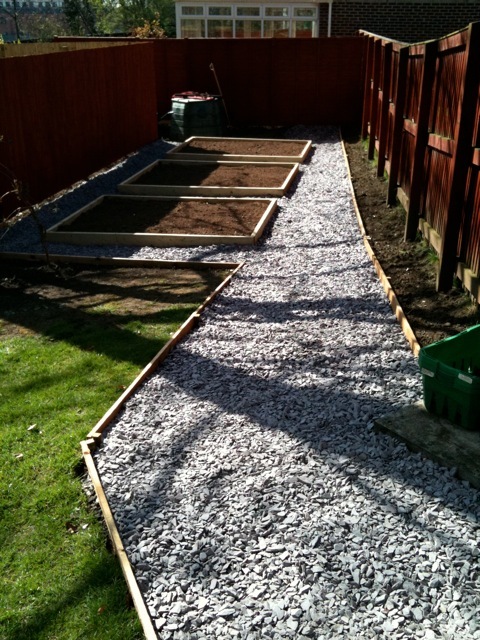 Next up was edging the area with wood so the gravel has a border to go up against. Again, this was tannelised and spiked into the ground. So far, we’ve used two tons of plum coloured slate (and I think we’ll need another ton to finish it). All of these materials came from local builders merchant, Maddens and Farmac. Before laying the gravel, we spread a permeable membrane on the ground to stop the weeds coming through. The beds were filled with a ton of topsoil (only £35) as we didn’t have enough spare topsoil elsewhere in the garden. The beds are now ready to be planted – we’ll probably dig in some manure to get the plants off to a flying start. We’re starting to plant the vegetables this weekend and I’ll report on the progress as the summer progresses. Wednesday saw two completely contrasting experiences for me. I spent the day hiking in the Yorkshire Dales and the evening crammed in a sweaty club in Leeds watching a band. And that’s just the way I like it. Simon’s Seat is a relatively small peak (just a hill, not anywhere near a mountain) in Wharfedale, which is in the lower Dales. Only a short 45 mins from Leeds, it’s set amidst stunning, classic Dales scenery. Patchwork quilt hillsides with dry stone walls mark the boundaries of ancient farmland – this is iconic scenery, and for a Yorkshireman it brings a tear to the eye. In early spring, it’s absolutely stunning with the fields full of newborn lambs and the trees just starting to come into leaf. On top of this, we plumped for a day when the weather was spectacular – clear blue skies and enough of a breeze to keep you on your toes. Amazing. The climb up to Simon’s Seat itself – ie the top – was pretty challenging to be honest, as I’ve not done any serious walking for some time. 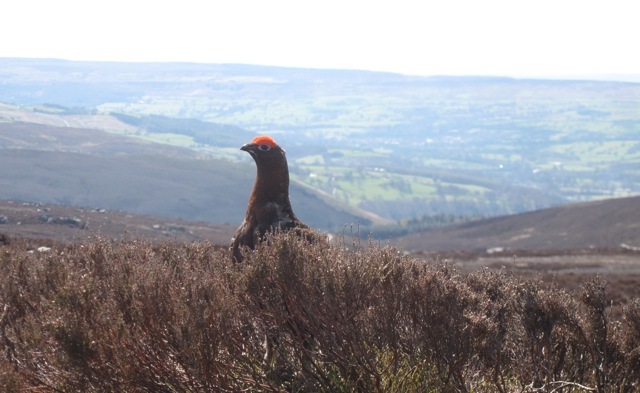 But the view from the top was well worth it though and although the photograph above look like a staged photo opportunity, the Grouse nestling in the heather was absolutely real! All in all we did around 10 miles I think and managed to fit in a rather nice pub lunch at The Craven Arms in Appletreewick. All in all, a rather splendid way to spend a day and I really do need to be doing much, much more of this. Good for the heart and the soul. By means of a complete contrast, the evening was spent in the company of the rather wonderful Duke & The King at the HiFi club in Leeds. I love live music and this evening was a fantastic experience – sublime, soulful music served up in a cramped basement club in the city centre of Leeds. The band’s frontman and founder is Simone Felice (of The Felice Brothers) and I’m a huge fan of the album and I’ve been desperate to see them live. I bought the tickets some while back and they’ve waited patiently in my little ‘ticket stash’ waiting for their moment. 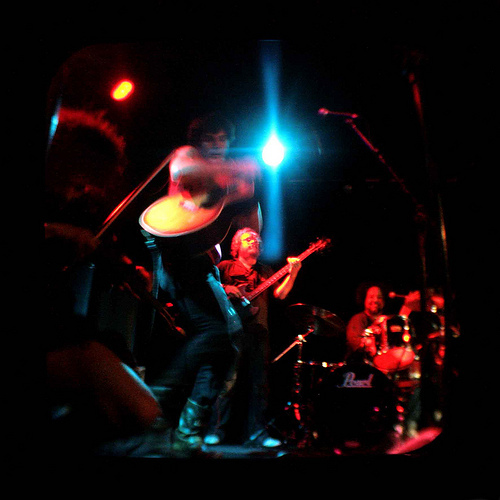 It’s hard to describe the music as it’s quite a contradictory mix of seventies Laurel Canyon MOR, bang up to date haunting acoustic and pure soul music. noted the crowd had more than its fair share of balding forty somethings and maybe that tells its own tale, but these were thankfully supplemented by a good number of hipsters. Although I myself fall into the former and not the latter bracket, I still like to think myself as one of the latter. Misguided, I know. If you get the chance, I would highly recommend you search out the band and dip in – you won’t be disappointed. The critics have been very kind to them and it’s for very good reasons. I urge you to seek them out without any delay.